The RadGauge control allows you to define ranges for your scales. The range is used for wrapping a specific section of the scale, that meets a condition. The Gauge control allows you to define ranges for your scales. The range is used for wrapping a specific section of the scale that meets a condition. The Gauge control provides you the single GaugeRange class which can be used with any scale type. Each range should have a start and and end points. They are defined via the Min and Max properties, where their values represent values from the scale. Typically each range should be colored in a specific color. To set the desired color to the range use its Background property. To learn more about the appearance of the range read the Range Appearance section. You can control the width of a range at its start and at its end point. This is done via the StartWidth and the EndWidth properties of the range. Their values should be relative to the cell size of the scale. In the case of the linear scale, this means to the width of the scale's container when the scale orientation is vertical or to the height of the scale's container when the scale orientation is horizontal, and in case of radial scale - to the radius of the scale's container. Background - specifies the fill color for the range. Stroke - specifies the stroke color for the range. StrokeThickness - specifies the thickness of the range's stroke. To modify the appearance of the indicator via the range, the indicator should be in Use Range Color mode. The IndicatorColorMixSensitivity property is used to colorize bar indicator. This feature is typical for the Bar Indicators. This property is applicable when RangeColorMode property of the indicator is set to MixedColor (works for both radial and linear scales), HorizontalGradient or VerticalGradient (work for linear scale only). 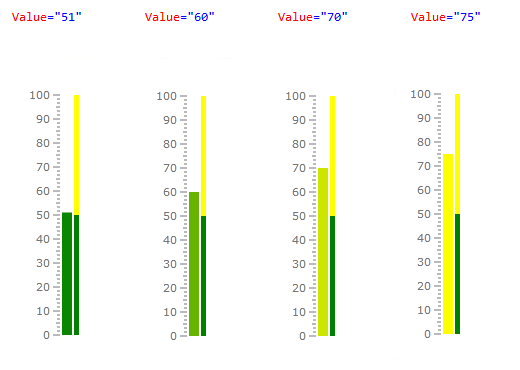 The IndicatorColorMixSensitivity property indicates how the colors of two ranges (previous and current) are mixed to create the background of the indicator. Its value can be a double between 0 and 1. For example, if the BarIndicator has its RangeColorMode set to MixedColor and range's IndicatorColorMixSensitivity property is set to 0.5 then the bar indicator will use mixed color from both current and previous ranges. The mixed color will be used when indicator takes a value from the range start and up to the half of it. To modify the appearance of the labels via the range, they should be in Use Range Color mode. To modify the appearance of the ticks via the range, they should be in Use Range Color mode. TickBackground - specifies the fill color for the ticks that belong to the range.